The Middletown Insider: Film Review: Capicorn One better than The Hunger Games? 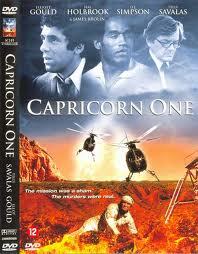 Film Review: Capicorn One better than The Hunger Games? Screw The Hunger Games, rent Capicorn One if you can find it! Capicorn One: Imagine a movie that features O.J. Simpson running from the cops years prior to his arrest for the murder of Nicole Brown Simpson and Ron Goldman- if you can visualize such a cinematic feat, than Capicorn Oneis for you. This 1978 Peter Hyams directed gem tells the tale of NASA staging a fake Mars landing for political and financial purposes. Kind of like flying to China or Washington D.C. to get your local middle Connecticut city out of debut. I love conspiracy type films that have guys in suits plotting to fool the American public with some far fetched ideas for selfish reasons; usually the filmmakers hire Hal Holbrook (The Firm), Robert Prosky (Thief) or J.T. Walsh(Backdraft) to serve as the evil self- serving government man that wears nice expensive suits. In this case, Holbrook plays the role of, like it matters, Dr. James Kelloway, NASA authority on the Mars landing. Guess what happens next? Holbrook decides to pull the plug on the Mars launch due to a faulty life support system; soon the astronauts are removed from their grounded space capsule and flown to an old abandoned United States Army Air Corp base deep in the desert. Why are all the secret bases always in the desert in these films? Where do these government people eat, live and socialize? Actually that would have made a better movie. Back to the plot: The astronauts played by James Brolin, Sam Waterson and O.J. Simpson are forced to remain in captivity for several months while they are periodically forced to film more fake Mars footage. When does O.J. run from the cops? Hold on tight it’s coming. Soon Elliot Gould’s reporter character finds a NASA technician who figures out what the big bad government guys are doing and wants to investigate further. Guess what? The technician winds up dead and Gould’s character is arrested, fired from his job and harassed by government agents dressed in black; they even fly black helicopters. Cut to the astronauts: who now realize that they need to get the hell out of dodge before Hal Holbrook turns them into fish food. Holbrook, not looking like Mark Twain, explains to the American public that the astronauts died upon re-entry. Big Lie!! I guess he didn’t count on the triple team up of Simpson, Waterson and Brolin to stage an amazing escape and tell the world the truth. Director Hyams shows us various shots of the actors in chase sequences and overuses the wide angles of his cameras; a move that would put Roger Corman to shame. In this movie, Simpson’s character is captured and presumably murdered by the government for doing nothing wrong, while on real Earth, Simpson ran from cops and was tried and acquitted of double homicide in 1994. Scary stuff. The ending: Elliot Gould, former Mr. Barbara Streisand, helps James Brolin, future Mr. Barbara Streisand expose the government’s lies and deception about the fake Mars landing and other assorted evil things. Whew! Only in the movies. Oh yeah, David Doyle, Bosley from TV’s Charlie’s Angels plays Gould’s boss that enjoys laughing at Elliot’s conspiracy theories. Good Stuff! Great Movie!! I remember watching it.. Was it made for TV? Where can I get this on dvd?